Steve Ballmer has left the building. Six months after resigning as CEO, the enthusiastic Microsoft figure is now leaving the board of directors to focus on his new career: owning the LA Clippers basketball team. "In the six months since leaving, I have become very busy. I see a combination of the Clippers, civic contribution, teaching and study taking a lot of time." he wrote in an open letter to new Microsoft head Satya Nadella. But Ballmer added "I bleed Microsoft", imploring the team to keep him in the loop. 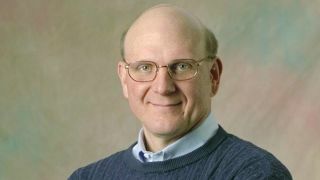 During his 34 year stay at Microsoft, Ballmer has given a lot to the company. But his more impressive legacy may be the one he's left on YouTube. So today, we remember some of the incredible footage the ex-CEO committed to video. You know, like the time he played Dr Evil. And when he tried to channel his inner salesman. And that time he and Gates did Night at the Roxbury. What was with this Windows 2000 advert, anyway? Hey, remember when he laughed off the iPhone? Ballmer leaves Microsoft, but in what shape?